Star Check Writer is a simple yet powerful application program used to make the process of printing your checks fast and easy. It prints on your own personal checks. Stop hand writing your checks, you have a computer and printer, use them. This program does not print your actual check, it fills in what you already have. There is no risk or costs involved with trying it out. So download and try it out today! There are many features that simplify the whole process of printing personal checks. There is a fully functional database that stores your Payees, and many more sets of data. 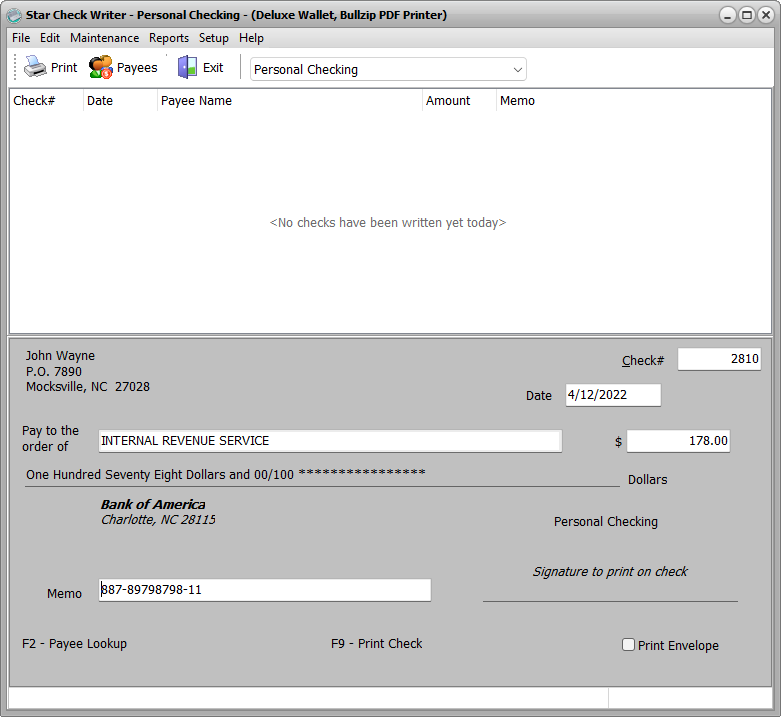 It is probably one of the easiest Personal Check Printing pieces of software on the market today. The cost for this software is only US$24. This gives you full usage of the program. It is a one time fee and gives you Support via email, along with all updates and upgrades for a period of one (1) year, or 365 days. The period begins at the original purchase date. Now, the program will still function after the 1st year, you will just not be available to download any of the updates or upgrades for free. The current cost for this software is only US$24. No restriction Try Before You Buy Trial good for 30 days. Here is a list of some of the features that are included in this award winning software package, along with a few pics of the system interface. We hope you all enjoy it and find it as useful as we do. * Unlimited Payee Records. * Unlimited Check definitions. * Unlimited Printers. * History Transaction records for easy tracking. * Add Payees on the fly. * Store Payee account numbers/dollar amounts for re-printing same amounts or monthly bills. * Don't use complicated programs when all you want to do is print a check. * Free upgrades/updates for a period of (1) year from date of purchase. * Many more features, download and try it out for yourself as it is fully functional for 30 days. This site does not contain serial number, crack, keygen Star Check Writer serial number : serial number is the simplest type of crack. A serial number(cdkey,product key,etc) is register the program as you may already know. a crack or keygen may contain harmful software. If you cannot find the exact version you want, just give it a try. for more information read .nfo/.txt/.diz file include in zipped file.